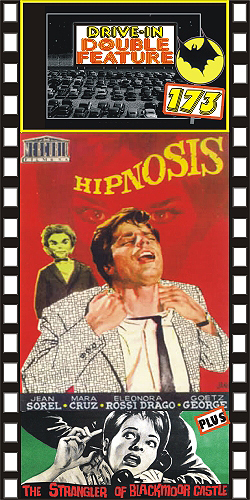 HYPNOSIS (1962, aka DUMMY OF DEATH) Jean Sorel, Heinz Drache, Gotz George, Margot Trooger, Werner Peters. A hypnotist is murdered in his dressing room! His ventriloquist dummy seemingly watches the crime being committed. A boxer and part-time delivery boy is blamed for the crime. Soon another murder occurs! Was the killer human…or was it the dummy? Lots of chills and suspense follows. This is a very cool, suspenseful Giallo-horror film. From 16mm. PLUS: STRANGLER OF BLACKMOOR CASTLE (1963) Karin Dor, Ingmar Zeisberg, Hans Neilsen, Rudold Fernau. A hooded maniac is loose and he’s murdering numerous people inside a dark, dank, creepy old English castle. Scotland Yard sends a detective to track down the mysterious killer. A cool Edgar Wallace chiller. From 16mm.